A selection of Frequently Asked Questions for patients who may be suffering from varicose veins. Varicose veins are superficial veins of the legs, which are swollen, tortuous and visible. They are very common. Arteries take blood down the legs and veins bring blood back up the legs, to the heart. There are two main systems of veins in the legs – the deep veins which carry most of the blood back up the legs to the heart, and the superficial veins, which can form varicose veins. Veins in the legs contain valves (see diagram), which, under normal circumstances only allow the blood to flow in one direction. Failure of the valves increases the pressure in the veins when standing. This excess pressure leads to dilation of the veins and the appearance of varicose veins. Varicose veins can run in families. Up to 50% of women may develop varicose veins during their lifetime but varicose veins are common in men as well. 3. What symptoms do varicose veins cause? Other than cosmetic concerns, the commonest symptoms from varicose veins are aching, discomfort, and heaviness of the legs. These symptoms are usually worse at the end of the day. In a few people the high pressure in the veins causes damage to the skin near the ankle, which can appear like brown staining of the skin or eczema (flaky, itchy skin). Ulceration of the leg may occur if these skin changes are allowed to progress, or if the skin is injured. Other problems that varicose veins can cause are phlebitis and bleeding. Phlebitis, or thrombophlebitis, means inflammation of the veins. The affected veins become hard and tender. This is not the same as deep vein thrombosis (DVT) and is not usually dangerous. The risk of bleeding as a result of injury to varicose veins worries many people, but this is very rare. 4. What tests can be used to investigate varicose veins? Most varicose veins originate from faulty valves at groin level or, less commonly, behind the knee. A detailed scan, called a Duplex ultrasound scan, is required if treatment is planned. The scan can detect leaking valves and map out the anatomy of the problem veins. 5. Why do I need treatment for my varicose veins? If you have varicose veins there are a number of reasons why you may decide to have intervention. Mr Lewis will discuss all the treatment options with you before you decide which treatment is best for you. The aim of varicose vein interventions is to reduce the pressure in the superficial veins. This will hopefully help relieve any symptoms caused by the varicose veins. Support stockings and daily moisturiser can further protect the skin. 6. What are the treatment options? Tight compression socks or stockings can help control the symptoms caused by varicose veins. They come in a variety of colours and styles and need to be carefully fitted. They can be prescribed by your GP. This involves injection of a fine foam into the varicose vein. The foam causes inflammation in the lining of the vein. Accurate and effective injection usually needs to be guided with an ultrasound machine. This is called ultrasound guided foam slerotherapy (UGS). Following injection the vein is compressed by bandaging the leg or wearing tight stockings. The inflammation causes the walls of the varicose vein to stick together. If this is successful the varicose vein will not be visible. Sometimes the vein is still visible after treatment and feels hard under the skin, like a cord. If this happens the vein will slowly disappear over the next few weeks. Vascular Specialists often use this technique but not usually as a first line treatment if you have significant valve failure. This is because injection can be less successful than other treatments. What happens during injection treatment? Injection treatment is done as an outpatient using a small needle that causes little discomfort. Each injected area will be covered with a pad, and a support stocking or a bandage will be applied to the leg. This puts some pressure on the veins that have been injected until the walls of the vein have ‘glued’ or stuck together. What should I do after injection treatment? You should walk for about 20 minutes after having your injections. The stocking or bandage must be worn continuously for 1 week. After this you can take the stocking off at night but wear it during the day for the rest of the following week. Remain as active as you can. Try to avoid standing still for long periods. There are no restrictions on your activities and you can return to work immediately after the treatment. It is reasonable to pursue most sports, but avoid very strenuous activities. What other effects or problems might there be? Sometimes more than one session of UGS might be needed to get a satisfactory result. The chemical substance that is injected into the vein can cause inflammation resulting in redness and discomfort. This will settle but if it is troublesome anti-inflammatory drugs or paracetamol will help. Deep vein thrombosis (DVT) is a possible consequence of injecting the varicose veins. DVT is rare but can be serious. Occasionally (less than 5% of patients) injections can produce brown staining of the skin in the areas where the veins were. It is not possible to predict the patients in whom it will happen. Although the brown staining usually fades over 6-12 months it can be permanent. It is also possible that a small ulcer or area of inflammation may develop at the site of injection. Although this will heal it takes time and may leave a small scar. Very rarely, blushes of tiny veins can appear in the skin over areas that have been injected. This is sometimes called “matting” and can also occur after surgery for varicose veins. Other very rare complications of injection sclerotherapy that have been described include allergic reaction, migraine, visual disturbance, chest tightness, myocardial infarction, seizure and stroke. Any treatment for varicose veins has a risk of varicose veins recurring. Endovenous Ablation Therapy or EVA is performed under local anaesthetic as a day case. Mr Lewis uses Radiofrequency Ablation (RFA) as opposed to laser ablation. This involves passing a fine fibre up the main varicose vein in the thigh or calf under ultrasound guidance. The end of the fibre heats up and causes a thermal injury to (burns) the inside of the vein as it is withdrawn. If successful, this causes the vein to block off and shrivel up, which in turn reduces the pressure in the veins lower down the leg, making them less visible. Some patients need further treatment in addition to RFA to “tidy up” any varicose veins that might still be visible. This further treatment might be either UGS, as described above, or phlebectomies. After RFA you will be fitted with bandages or support stockings, asked to walk around for 10 minutes and then allowed go home. The stocking or bandage must be worn continuously for the first week after treatment. After this you can take the stocking off at night but wear it during the day for the rest of the next week. You should not drive on the day of treatment. If travelling by car for more than one hour, you should sit on the back seat with your leg(s) on the seat, stop hourly and walk for 5 minutes. During the first few days you will probably feel some discomfort or tightness over the treated vein. To minimise this you may wish to take simple painkillers. Normal activity, including work, can be resumed as soon as you like although we suggest avoiding contact sports, the gym and swimming for 2-3 weeks after EVA. When the support stocking is first removed there may be some bruising over the treated vein. This is normal together with some hardness under the skin. This will settle down. What are the results of EVA? EVA is a relatively new method of treating varicose veins. In patients who had EVA more than five years ago the results are as good as surgery. Are there any complications from EVA? Complications following EVA are uncommon. They include: failure to obliterate the vein being treated. This occurs in about 1-3% of patients. If the vein is not obliterated and you still wish to have treatment for your varicose veins, then the options are to repeat EVA, perform conventional surgery or ultrasound guided sclerotherapy. Excessive bruising and/or tenderness is seen in less than 5% of patients. If it occurs it may be helpful to continue taking painkillers for a longer period of time with the agreement of your GP. About 1% of patients may experience some numbness in the lower leg after EVA. This is almost always temporary. Symptomatic deep vein thrombosis (DVT) is a rare complication of EVA. Any treatment for varicose veins has a risk of varicose veins recurring. Varicose vein surgery is usually performed as a Day Case. The Vascular Surgeon who will be performing your operation will visit you immediately before the procedure. Your veins will be marked with a waterproof pen. The doctor who will give you the anaesthetic will also visit you. Varicose vein surgery is usually performed under general anaesthetic. While you are asleep, local anaesthetic will be used around the surgical incision to reduce pain after the operation. 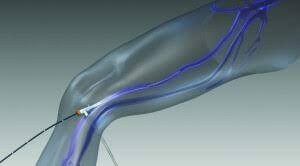 Sometimes a drip is placed into a vein in your arm to give you some fluids during and following surgery. The operation varies a little from person to person, depending on the anatomy of your varicose veins and where the faulty valves are. Normally you will have a cut about 3-4cm long running obliquely in the skin crease of the groin. Through this incision the top end of the principal vein (great saphenous vein) is tied off and divided immediately next to its connection with the main deep vein of the leg. A soft flexible wire is passed down the leg, in the vein, to knee level. At knee level a second small incision is made to retrieve the vein which contains the wire. The vein is stripped from the leg using this wire. Less frequently, when the principal vein on the back of the knee (the small saphenous vein) has a leaking valve, it needs ligation. This is performed through a horizontal incision about 3cm long on the back of the knee. The vein is tied and divided immediately adjacent to its connection with the main deep vein of the leg. The small saphenous vein is rarely stripped from the leg because it lies close to a nerve which may be damaged. Finally, in most cases, the visible varicose veins are removed from the leg through tiny incisions about 2-3mm in length. Incisions are placed about 3-5cm apart along the line of the varicose vein. There may be a large number of tiny incisions if your varicose veins are extensive. The larger incisions are closed with a stitch, which lies beneath the skin and doesn’t need to be removed. The smaller incisions are closed with paper stitches. The leg is bandaged firmly from toe to groin at the end of the operation. You will be taken to the Recovery area after the operation. Some people describe the feeling in the leg as stinging or burning when they wake up. It is unusual for the leg to be painful. You must let the nurses or doctors know if you are in pain. Some of the smaller incisions may bleed a little over the first 24-48 hours. For this reason, it is best to keep the leg covered with bandages for the first 24-48 hours. Before you leave hospital you will be given a typed sheet of post operative instructions. This explains when and where to have the bandages removed, how long to wear the stockings for, what to expect in the post-operative period and follow up by your Vascular Surgeon. The incisions, although initially very visible, will subside to become virtually invisible within 9-12 months. There is usually extensive bruising in the leg, particularly down the inside of the thigh. This bruising usually lasts for 4-6 weeks. Most people describe the leg as sore or uncomfortable when they get home. The discomfort usually resolves 12-14 days after the operation. Sometimes no painkillers are required at all but we recommend that you take painkillers regularly for the first few days after surgery. Regular daily exercise, such as going for gentle walks to provide a gradual return to normal activity, is recommended. To rest up completely after the operation increases the risk of developing blood clots in the deep veins of the leg (deep vein thrombosis or DVT). Driving: You will be able to drive within seven days of the operation provided the leg is not too uncomfortable. Bathing: You can shower or bath within 48 hours of the operation. Sometimes bathing or showering immediately after surgery may lead to bleeding from the smaller incisions. Work: If this applies to you, you should be able to return to work within a few weeks of surgery depending on your job. Your GP will advise you of this when you see him/her for your sick-leave note. Lifting: There are no strict limitations to lifting but heavy lifting is probably best avoided for two weeks. Medicines: You may be sent home with some painkillers. You will be advised on their use before you leave hospital. Complications after varicose vein surgery are uncommon. Serious complications are rare. The Vascular Surgeons will outline the potential risks of your operation and will discuss these risks with you. You will be given lots of opportunities to ask any questions that you may have. Chest infections: These can occur following this type of surgery, particularly in smokers, and may require treatment with antibiotics and physiotherapy. Wound infection: Wounds sometimes become infected and this may need treatment with antibiotics. This is more common with redo varicose vein operations in the groin. Bad infections are rare. Fluid build up/leak from wound: Occasionally the groin incision may leak blood-stained or clear fluid. Usually this only lasts a few days. Sometimes, clear fluid collects under the groin incision. It may be contained beneath the skin or it may leak through the incision. It is called a lymphocele or lymph leak. This complication mainly occurs following re-operation on the groin. If there is leakage from the groin, it may take up to six weeks to settle. Rarely lymphocoeles need further surgery to fix them. Nerve injuries: These are uncommon, occurring in about 1 in 20 cases. Two skin nerves are particularly at risk. These help with sensation over the inner thigh and calf, and the second on the outer border of the foot. Other nerves may also sometimes be damaged, leading to reduced or altered sensation anywhere in the leg. The reduced sensation may be very noticeable at first, but normally fades with time, and is not usually a problem in the longer term. Deep Vein Thrombosis: DVT occurs occasionally following varicose vein surgery. Women taking the oral contraceptive pill may be at increased risk of developing DVT. Rarely the blood clot in the deep vein can travel to the lung. This is called a pulmonary embolus and can be very serious. Recurrent Varicose Veins: Recurrence of varicose veins occurs in a large proportion of patients over a ten-year period. Sometimes further treatment may be required. When you get home, try to return to normal as soon as possible. The more exercise you take, the more sore your leg will be, but the quicker the leg will return to normal.